Very interesting reissue of the original LP from the mid sixties, recorded at Federal records. 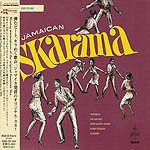 It is a tribute to the producer Kenneth L Khouri, in 1954 Ken Khouri started Jamaica's first record label, "Federal Records" Described as the man behind the Ska scene Baba Brooks on trumpet with his Band, they are the backing group on these recordings. Issued on Kentone as a cardboard CD package by Dub Store Records DSR CD 503 Japanese import.